The IPXHD005 custom fit countertop mount fits the Apple iPad. This mount package includes Arkon’s Custom Fit Apple iPad Holder and Heavy-Duty Aluminum Mount with 10” Adjustable Arm and 4-Hole Drill Base. The durable plastic holder is made specifically for the iPad with Retina display, and iPad 4, 3, and 2 only and is not compatible with the iPad mini or iPad Air. 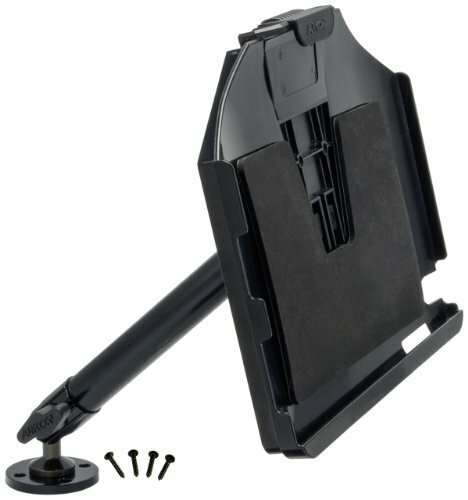 The custom holder provides support around the edge of the iPad, and cutouts are provided for easy access to the camera, power button, and power outlet. To install the iPad, just snap the device into the holder. This holder is not compatible with protective cases. The 4-hole drill base mount is made of strong aluminum, and is ideal for environments where a more permanent solution is desirable, such as in a kitchen, workshop, or in retail. Screws are included. Bend the 10” adjustable arm and rotate the swivel ball adapter head for 360° rotation for exact positioning of the iPad. For an iPad holder version with lock and key, Arkon recommends model IPMCLHD005, also available on Amazon.